I woke up at 5am with lots of energy. I slept well like at home, soft pillow and mattress. I heard other peregrinos already going out the door; I made coffee in our albergue and went out to fix another flat tire. So at dawn I was changing a flat tire, Jessy slept till 6 and by seven we were out the door. We rode into town for breakfast but all was still closed, so we moved on to another town. 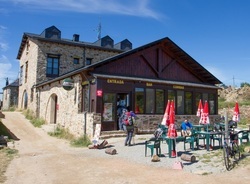 When we reached Foncebadon we had a couple of freshly made croissants, this was already up on the mountains and the elevation was going to get tough. Outside the albergue was an 84 Range Rover which reminded me of my 1986 Land Cruiser, it belonged to the owner of the albergue, we talked about our trucks. On our way up the hill we were not sure where to go with a fork on the road which was poorly marked. One was a downhill the other an uphill, when along came another rider, he told us that he was fairly sure that it was the low road, so we followed. Within a mile a car came by and we asked him if we were on the right road, he said no, that we should have kept climbing the mountain. So we returned and were now headed on the right path. The climb this morning was from 740 meters above sea level to about 1500 meters. We finally crossed the Cruz de Ferro, were you leave a stone for the changes you would like in your life or in remembrance of someone, as Jessica had done for her Grandmother Emilia. It consists of a wooden pole about five feet high surmounted by an iron cross, a replica of the original preserved in the Museo de los Caminos in Astorga. At its base there has been a mound forming over the years.There are several theories as to the origin of the cross: It may have been erected to mark the road when it snows, as it becomes frequently hidden from view. Others believe it is just a pile of stones called Montes de Mercurio, erected since Celtic times to mark the strategic locations of the roads and then Christianized with crosses. In this case, the cross was placed there in the early eleventh century by Gaucelmo; abbot of the lodgings at Foncebadón and Manjarín. Later Galician crop reapers would be on this path on the way to the farmlands of Castile and León, where they went to work. Those who continued the tradition by placing a stone along path, then called it Cruz de Ferro. We took several pictures and climbed to the top. We had now reached a high peak and the ride down the mountain was hard on the brakes, it is now about 10:30 in the morning, the sun is out and Jessica had to stop to put on her jacket for the cold at this altitude. I had to put on my makeshift sock gloves over my hands again. At about 11 am we arrived in the town of Molinaseca and each had a Margarita Pizza. We rode on trying to get to O Cebreiro but I got another flat as we neared Villafranca del Bierzo. It was about 5pm as we headed up to the albergue municipal, it was like a scene from The Hobbit. Because we arrived so late we got the beds in the corner that when you lay on the bed and lifted your head you would hit it on the ceiling and since we were right by the ceiling the heat rose and it was difficult to go to sleep, but by three o’clock in the morning it was freezing. After walking around the town we came back and I needed to fix two flats, I had run out of patches and an Italian guy gave me two patches, then a few minutes later an Irish gave me three more patches and he helped me fix the flats. The Irish guy was there with his wife, she was walking and he was riding. She would take off 2-3 hours early and they would meet at the end of the day in their pre-planned albergue. All peregrinos sleep less than 2 feet from each other in just about every albergue, but all have respect for each other.